Here you will find selected articles about our work, from Focus on Early Learning in action to results and research studies. We hope that this sparks your interest to see more - if you would like to see Focus on Early Learning in action, contact us today! An Uneven Path: Student Achievement in Boston Public Schools 2007-2017 (highlights Early Education as a “bright spot” and strong success, Bellwether Education Partners), February 2019. Report: Boston Public Schools makes strides in connecting pre-K, early grades (Education Dive), December 2018. A Focus on Teaching and Learning in Pre-K through 2nd Grade: Lessons from Boston (New America), November 2018. Innovation Pathways: A Personalized Professional Development Approach (NextGen Learning), September 2018. Running on a new promise for Pre-K (The Hill), September 2018. Leading the Way: TeeAra Dias builds bridges between Boston’s public school and community-based pre-K programs (Eye on Early Education), August 2018. A New Book Tells the Story of Boston's Preschool Program (Eye on Early Education), July 2018. Fostering Equity Through Educator and Family Empowerment (New America), July 2018. Summer Learning Part II: Cities Take the Lead (Eye on Early Education), July 2018. How 3 States Are Closing the Opportunity Gap by Bringing High-Quality Personalized Learning Programs Into Free Public Schools (The 74 Million), May 2018. Preschool Curricula and Professional Development Features for Getting to High-Quality Implementation at Scale: A Comparative Review Across Five Trials (AERA Open), March 2018. Making Elementary School School A Lot More Fun: Like Preschool (NPR), March 2018. Zuckerberg, Chan donate $30 million to literacy effort (Boston Globe), March 2018. The Solution for the Workforce Dilemma is the Public Schools (from the New America blog series "Moving Beyond False Choices for Early Childhood Educators"), February 2018. Where are They Now? Update on our previous Greenovate Award (Greenovate City of Boston), February 2018. Building a Foundation for Success: Boston's Progress Toward High-Quality Universal Pre-K (Presentation to School Committee), January 2018. Students Become Scientists through Haynes EEC-New England Aquarium Partnership (Boston After School & Beyond), August 2017. The Challenge of Sustaining Preschool Impacts: Introducing ExCEL P-3 (MDRC), July 2017. Where Are All the Preschoolers? (The Atlantic, about PEG), May 2017. The Current State of Scientific Knowledge on Pre-Kindergarten Effects (Brookings Institute), April 2017 (also see: Consensus Statement). Strategic Plan for the next 5 years (Boston School Committee), April 2017. BPS revamp aims to aid grades 1, 2 (Boston Herald), April 2017. How Discrimination Nearly Stalled a Dual-Language Program in Boston (The Atlantic), April 2017 (about the new Mattapan Early Education Center). Closing the pre-K math education gaps for Latino students (District Administration), April 2017. Mattapan early ed. center pitches dual language Haitian Creole program (Dorchester Reporter), March 2017. Report Offers Promising Examples of PreK-3rd Alignment Work (New America), January 2017. The Joy of Teaching Math to 3-Year-Olds (Eye on Early Education), November 2016. The Power of a Good Kindergarten Curriculum (P-3 Learning Hub), October 2016. Counting the Benefits of Teaching Math to 3-year-olds (PBS), September 2016. 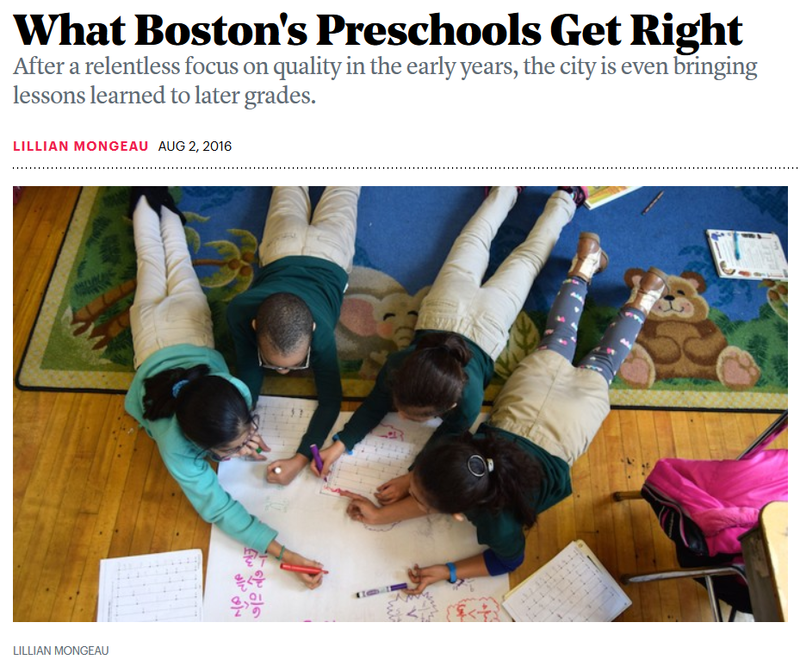 What Boston's Preschools Get Right (The Atlantic), August 2016. Charting a Course to Universal, High-Quality Pre-K (Barr Foundation), June 2016. "Our Boston" - Kindergartners Design a Better City (Eye on Early Education), May 2016. Beyond Kindergarten Suspensions: Don't Shame Children - Teach Them (WBUR), February 2016. Guaranteed pre-K gives kids a strong start (Boston Globe Op-Ed by Mayor Martin Walsh and Superintendent Tommy Chang), January 2016. Does Pre-K Make Any Difference? (New York Times), October 2015. More Preschool for Kids in Boston (Coverage of Preschool Expansion Grant visit to Roxbury YMCA, Boston Neighborhood Network), September 2015. Summer Program Teaches Third-Graders Bicycle Safety (Boston Globe; also see twitter), August 2015. How are the Common Core Standards Affecting Kindergarten (WBUR radio interview with Dr. Nancy Carlsson-Paige, Professor Emeritus at Lesley University), June 2015. Our Boston: Young Children Participate in the City's Civic Dialogue (Eye on Early Education), May 2015. Seattle's Preschool Program is Starting to Take Shape With a Little Help from Boston (KPLU), March 2015. Developing an Integrated P-3 Approach to Teaching and Learning (from Full Day Kindergarten in a PreK-3rd Grade Strategy webinar, pages 15-24), February 2015. How Teachers Can Make a Difference for Boys of Color (EdWeek), February 2015 (by Jen Aponte, Pre-K teacher). Interview with Jason Sachs in Early Learning at ED newsletter, January 2015. Playbook for Becoming an Early Learning Community (BPS PreK and Boston K1DS are featured) (White House), December 2014. Jason Sachs, invited speaker in the Equity and Excellence in the Earliest Years discussion at the White House Summit on Early Childhood Education, December 2014. Lessons from Research and the Classroom: Implementing High-Quality Pre-K that Makes a Difference for Young Children (Gates Foundation), September 2014. A New Approach to Scaling High-Quality Pre-Kindergarten (Barr Foundation), August 2014. Teaching a New Curriculum in East Boston (Three-part series: Part 1, Part 2, Part 3), August 2014. Building on What's Working in Early Education in Boston (Barr Foundation), July 2014. Engaging Children as Citizens of the Earth (Focus on Kindergarten highlighted by Lesley University), July 2014. High Quality Preschool Expansion: What Does Research Say? (Congressional Briefing), April 29, 2014. Students Learn with 'Bee-Bots' (Boston Herald) (video), June 2014. An Early Civics Education for Young Bostonians (related to Focus on Kindergarten's Unit 3), May 2014. With Preschool on the Agenda, Boston Attracts National Attention (WBUR, Boston's NPR news station), March 2014. Storytelling, Story Acting, and Literacy in the Boston Public Schools (Interview in the American Journal of Play), Winter 2014. Mayor Walsh and BPS hosted 40 community leaders and educators from Seattle, who were observing the BPS early-education program in an effort to bring Boston's successful model to the west coast. (South End News; Dorchester Reporter), March 2014. Getting to Universal Pre-K in Seattle, March 2014. Storytelling, Story Acting, and Literacy in the Boston Public Schools: An Interview with Jason Sachs, Ben Mardell, and Marina Boni (Journal of Play), Winter 2014. The BPS K1 program is highlighted as an exemplar in the book Restoring Opportunity: The Crisis of Inequality and the Challenge for American Education and in The Atlantic article "How Public Schools Can Fight Back Against Inequality". (video on the Restoring Opportunity YouTube Channel). The Role of Public Schools in Early Childhood Education: Benefits and Opportunities - The 2nd International Research in Early Childhood Education Conference - Universidad Diego Portales, Chile, January 2014 (Conference Link; Program Guide in English and Spanish). Idea Lab: How to Build a Large-Scale Universal Preschool Program. How Boston's Preschools went from Mediocre to Outstanding, January 2014. Early Childhood Structures and Results: Lessons and Implications from Boston Public Schools - Council of Great City Schools, November 2013. Thinking about K-3 Structures: Lessons from Boston Public Schools - Seattle, WA, November 2013. Early Educators Creating Civic Opportunities for Children (Eye on Early Education), October 2013. Children as Citizens (Eye on Early Education), October 2013. Harvard Pre-K study: Impacts of a Prekindergarten Program on Children's Mathematics, Language, Literacy, Executive Functioning, and Emotional Skills (Child Development), November/December 2013. Making Learning Visible at the Boston Children's Museum, June 2012 (also see Making Learning Visible at BPS). Educational Alignment for Young Children: Profiles of Local Innovation (National League of Cities), April 2012. Why Early Childhood Matters: The Impact of BPS K1 (Boston School Committee), April 2012. Impacts of BPS K1 on Children's Early Numeracy, Language, Literacy, Executive Functioning, and Emotional Development (Boston School Committee), April 2012. Kindergarten: Why We Need to Change it (Advocates for the Children of New Jersey), November 2011. Community-Based K1 Partnership with BPS (Boston K1DS Grant) - for more information see Boston PEG. Boston's Rapid Expansion of Public School-Based Preschool: Promoting Quality, Lessons Learned (NAEYC's Young Children), September 2010. The Rights of Children: Policies to Best Serve 3, 4, and 5 Year Olds in Public Schools, Spring 2010. Why Cities Are Making Preschool Education Available to All Children. Boston is highlighted in a case study from the National League of Cities in their publication Educational Alignment for Young Children: Profiles of Local Innovation. This case study provides a history of Pre-K inside Boston, through various BPS departments and public-private partnerships such as Thrive in 5. Image at top of page taken from "What Boston's Preschools Get Right", The Atlantic, August 2016 by Lillian Mongeau.